Despite some legendary sources claiming that the Buddhist flag dates to the second century B.C., the most credible sources indicate that it was conceived much more recently: the 19th century A.D. In 1885, the Colombo Committee, a group of devoted Buddhists in Colombo, Sri Lanka, set about designing a flag to be flown for Vesak day, which celebrates the birth, enlightenment, and death of Gautama Buddha. This was a big deal in Sri Lanka, because it would be the first year that the British-controlled government of Sri Lanka would make Vesak day a public holiday. The six vertical-band design that they came up with is meant to represent the colors of the aura that was emitted by Buddha when he attained enlightenment. Beyond that, each individual band has a symbolic meaning within Buddhism: Blue (Nīla) symbolizes the spirt of Universal Compassion to all beings; Yellow (Pīta) symbolizes The Middle Way, a belief in avoiding extremes to bring balance and liberation; Red (Lohita) symbolizes the blessings that practicing the teachings of Buddha brings; White (Odāta) symbolizes the purity of Buddha’s teachings; Orange (Manjesta) symbolizes the wisdom of Buddha’s teachings; and the five-color spectrum in the sixth stripe represents the universality of all of these principles, known as the Prabashvara. In actuality, Prabashvara is a compound of the five colors, but has been broken down into its spectrum so that it could easily represented on a flag. Originally the design of the Colombo Committee was much longer than what it is today. Colonel Henry Steel Olcott, a former American soldier and journalist who is known for his contribution to the revival of Buddhism in Sri Lanka, suggested that condensing the design into the size of a national flag would make it more convenient. Olcott’s suggestion stuck and the flag flew on the first nationally recognized Vesak day in Sri Lanka in 1885. Buddhist flag defaced with a Dharma wheel. Following its introduction, the flag gained popularity and spread to Buddhist communities around the world. By 1952, the World Fellowship of Buddhists would officially make it the international flag of Buddhism. As I mentioned in the introduction, this is the only official flag of a religion representing all its sects. 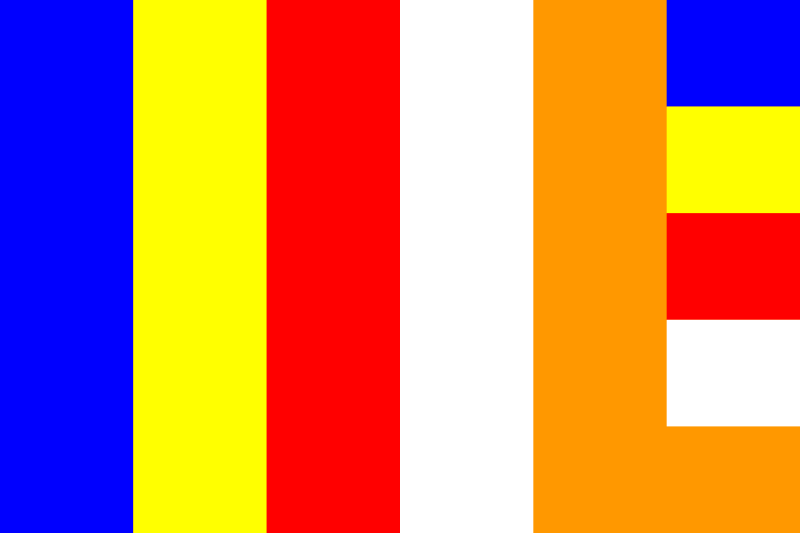 However, this would not stop some followers in different sects of Buddhism from adapting the design to make their own unique flags to emphasize their own teachings. As of 2016, there are at least six variants on the six vertical-stripe design, each changing one or two of the five colors. These designs include Tibetan, Burmese, Nepalese, and Japanese variants. There is also a fairly popular version of the traditional Buddhist flag defaced by a Dharma wheel, another significant symbol in Buddhism that is meant to represent the path to enlightenment. Prayer flags in Kathmandu, Nepal. While flags hold a special significance in all of Buddhism, Nepalese and Tibetan Buddhism have a unique take on religious flags. If you’ve ever seen pictures of the Himalayan mountain ranges, Nepalese cities, or Tibetan villages, you’ve probably seen many small, colored pieces of fabric strung between two points, often over pathways. These are known as prayer flags, because each flag features a prayer or mantra printed on it that is meant to be carried by the wind to bless everyone in the surrounding area. The prayer flags are traditionally arranged in a specific color order (blue, white, red, green, and yellow) representing the five elements. Each printing also contains a horse that is carrying three flaming jewels that represent the three tenants of Nepalese Buddhism; Buddha, his teachings (Dharam), and the Buddhist community (Sangha). Another common type of prayer flag is the Darchor or vertical prayer flag, which are large, single rectangles hung directly from a vertical pole instead of a string. It is believed that the best time to hang prayer flags is on sunny, windy days and worn out flags should be replaced on the Tibetan New Year. *Many religions have flags, but no other religion has an official flag that represents all of its people. For instance, many of the different Christian sects (Methodist, Episcopalian, Catholicism) have their own flags in varying degrees of official capacity.